GTViewer and GTVx support a variety of raster configurations. These different configurations are determined by your needs, you raster file type, and your intended uses. This post will try to clarify the differences between the configurations and will hopefully provide enough information to allow you to determine which type of raster is best for you. GTViewer divides data up in to Categories. The structure of your original data usually determines how Categories are laid out for GTViewer; however, there are no hard-and-fast rules as to how this is done. Categories have their own display controls (display status, min threshold, max threshold). All of the raster formats supported by GTViewer and GTVx can be used in a Category configuration meaning that you can create a Category for one or more raster files. When this Raster category is turned on, the raster files are displayed and the display thresholds defined for the category will automatically turn all of the raster files on or off according to the zoom level. Raster Catgories can support all GTViewer supported raster formats (ECW, MrSID, CIT, RLE). GTViewer and GTVx also support a Non-Category Raster configuration where a list of raster files (ECW or MrSID) is supplied along with an independent display status and threshold for each file. The Raster Display Filter Dialog allows the user to independently control the display of each Non-Category Raster file. Pocket GTViewer has limited raster support, but it does support the ECW file format in a Non-Category Raster configuration. The raster requirements on the Pocket PC or Windows Mobile platforms are generally much different than on the Desktop because of the limited resources of the devices. This configuration seems to work best on devices. Originally, the Non-Category configuration was only for Pocket GTViewer, but its usability was so good that the functionality was also integrated into GTViewer and GTVx. ER Mapper’s ECW raster format in Non-Category configurations. - FIX - Magnify did not show raster for non-category raster. - FIX - Deleted Elements in Category Data were being displayed. - NEW - Print Overview can be defined as a view. - NEW - Print Overview can be set to Small, Medium, or Large. - NEW - Border Note Field added to Print Dialog. the same time (same edit will be applied to all common properties). same spot in the list after an edit to a style definition. - NEW - A horizontal scroll bar has been added to the Style Definition list box. - FIX - Style Manager Delete Style Definition did not work correctly. - NEW - Style Manager Delete can now delete all selected Style Definitions. - NEW - Style Manager now has Import Map and Import Def commands. - NEW - Style Manager supports a category filter on the style definition display. GTVx version 4.0.x.5 is now available. An excerpt of the readme.txt is shown below. This version has only minor changes. The most significant item is the addition of the the Double Click event in the Data Monitor. for enabling or disabling the double click event for data monitor items. GTViewer and Pocket GTViewer can all use a GPS to update their view position and reflect an actual location in real-time. The GPS functionality allows the use of any GPS receiver supporting the standard NMEA protocol or Trimble’s TSIP protocol. GPS receivers are generally connected to a COM port; however, modern GPS devices also use BlueTooth, PCMCIA slots, CF slots, and can be built into the laptop or handheld computer. A GPS receiver is a nice addition to map viewing because it will keep the view centered on your location without having to manually pan, zoom, or query to get there. This “view synchronization” runs in the background and doesn’t prevent GTViewer from using any of the other commands (like Attribute Info, redlining, etc.). Even with inexpensive GPS receivers whose accuracy may not be precise enough to capture location points, it is still quite satisfactory for view synchronization. Keep In View Mode – the indicator will move around the view, but if it leaves the current view area, the view will be updated so that the indicator re-centered. This mode is ideal if you are moving slowly or covering a small area because the view will not continuously update because of the movement. Keep Centered Mode – the indicator is always in the center of the view and the map moves under it. This mode is good for driving as the cursor is fixed and the map moves under it; however, this mode does require many more view updates and make it more difficult to perform other tasks when moving. Free Mode – the indicator will be displayed, but the view will not update to keep it visible. This mode unhinges the GPS indicator from the view turning off the view synchronization, yet still showing the GPS cursor when it is in the view. Centered/No Indicator Mode – identical to Keep Centered, except the indicator is not drawn. This mode is good if you are just interested in keeping the view synchronized with the current location, but do not want the indicator displayed in the view. The GPS indicator not only shows the position on the map, it also has a small red arrow head showing the current bearing. GTViewer and Pocket GTViewer also provide two different trail modes. 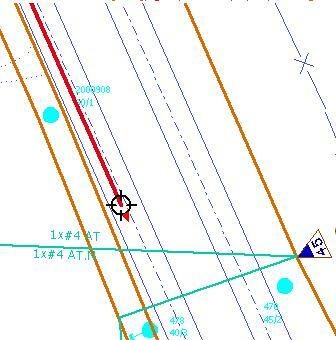 A trail is a line drawn along the path the GPS indicator follows. The Redline Trail mode leave a redline along the path and it can be saved, exported, shared, etc. 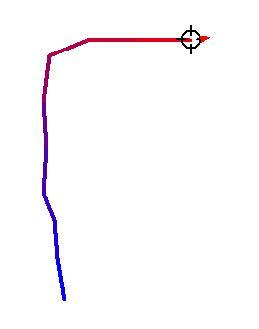 The Decaying Line mode draws a trail of a user specified length, but the line is temporary and will shrink over time. The line is draw in Red and “cools” to Blue. GTViewer and Pocket GTViewer both have a GPS Info dialog that shows detailed information about the current GPS readings. One page shows the tabular data like Latitude/Longitude/Altitude, HDOP/PDOP/VDOP, Bearing and Speed, and Satellites in Use/Signal Quality/GPS Time. 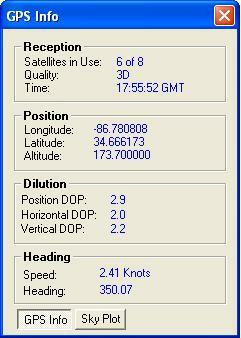 The second page is a skyplot showing the relative position of each satellite and its signal strength. The GPS functionality also supports two simulation modes. One simulation will read a file of Latitude/Longitude pairs and “play” them back as if they where actually being received by a GPS receiver. 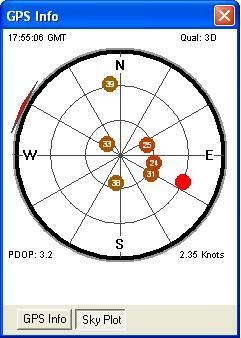 The second simulation mode will read an NMEA stream from a file and “play” it back as if it were being received by a GPS receiver. The difference in the two modes is that mode uses a source file that can be easily manufactured with some known points. The other mode uses a richer set of information and runs all of the GPS Info settings including the Skyplot, the drawback is that the file is usually much larger and needs to be captured from an actual GPS receiver at some point. - FIX - Links on features with repeating components would double the entries on the Link Tab. - FIX - Elements that use a style rule to control the weight were not highlighted correctly. The element weight was used instead. - NEW - Four new style added for dimension elements. Start Arrow Outside, Start Arrow Inside, End Arrow Outside, End Arrow Inside. - FIX - Dimension Dialog did not use a Droplist for style. - NEW - Default Symbol can now be specified. - FIX - The InterpolatePointOnElement did not work when the reverse flag was used. - FIX - The Tab Order on Query Dialog boxes with more than 3 prompts was not correct. - FIX - InterpolatePointOnElement returned -1 instead of FALSE for invalid Category. - FIX - Measure values were not computed correctly using coordinate factors. - FIX - Custom background colors were reset after a print or print preview. - FIX - Problem with using the control to select or unselect session graphic elements. - NEW - Dimension and Leader Line modes are now supported.